A study has identified the musk deer, found in the Mustang region of Nepal, as the Kashmir musk deer and established it as a new species record from Nepal. The identification of the Kashmir musk deer from Nepal, earlier believed to be the alpine musk deer, has extended the deer species’ range from India, Pakistan and eastern Afghanistan to western Nepal. Two other lineages from central Nepal are identified as Himalayan musk deer, representing a species complex widespread throughout the central and eastern Himalayan region. 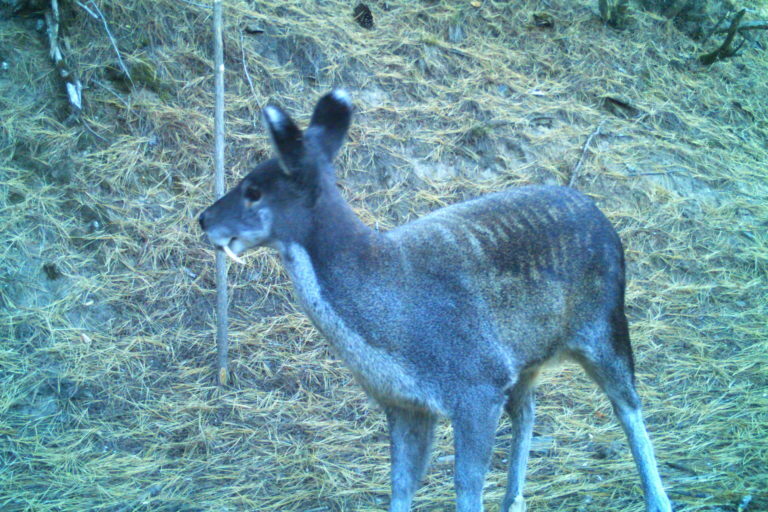 A study has provided evidence of the presence of the endangered Kashmir musk deer (KMD) from Nepal, with the identification extending the fanged deer species’ range from India, Pakistan and eastern Afghanistan to now the rugged mountains of western Nepal. The study by Nepali and Chinese researchers identified and probed three musk deer lineages from different geographic realms: Mustang in the west, Manang in the east and Kaski (most of the mountains above 7000 metres) in the south of Annapurna Himalayas range in Nepal. Researchers genetically validated the Mustang lineage as a distinct species, the Kashmir musk deer (Moschus cupreus) and in doing so established it as a new species recorded in Nepal. “Before this study, KMD had only been described from Kashmir and the associated region of India, Pakistan and eastern Afghanistan. The western distribution of KMD is up to Nuristan, northeast Afghanistan while the eastern distribution was assumed to be the Kashmir region in India,” explained study author Paras Bikram Singh. Singh is a conservation officer with the National Trust for Nature Conservation, Annapurna Conservation Area Project, Nepal and is also associated with Key Laboratory of Animal Ecology and Conservation Biology, Institute of Zoology, Chinese Academy of Sciences, Beijing. Singh studied the musk deer under the supervision of professor Jiang Zhigang of the Chinese Academy of Sciences, Beijing. 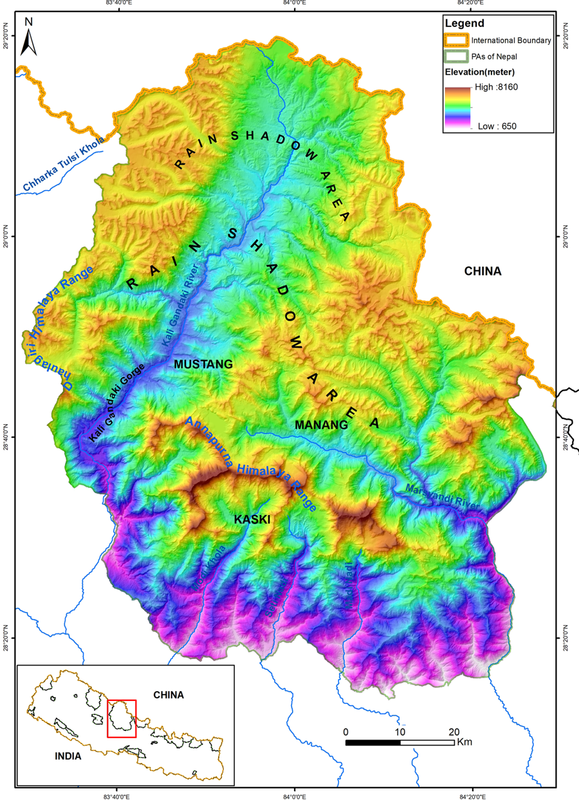 Annapurna and Dhaulagiri Himalayas, Kaligandaki river and gorge, rain shadow areas, and sample collections sites in Annapurna Conservation Area (Kaski, Manang and Mustang). Map from the study. 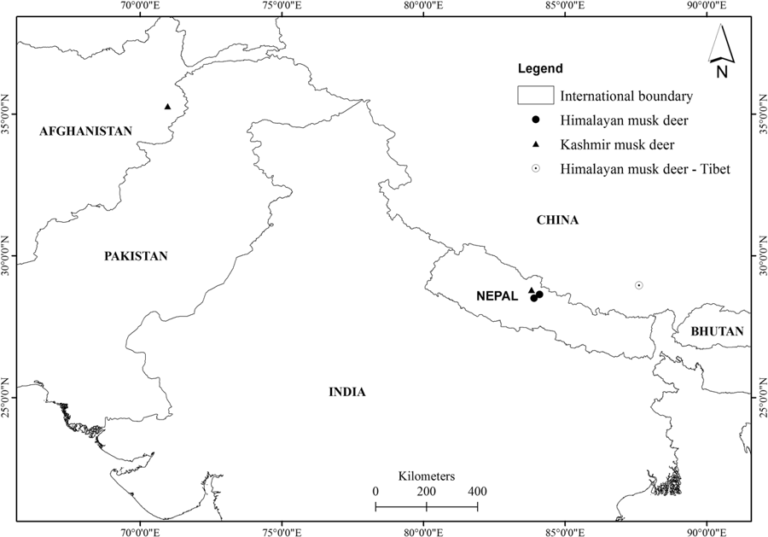 Investigations using molecular tools and camera trap methods also established the Manang and Kaski lineages from central Nepal as Himalayan musk deer (HMD), Moschus leucogaster. “Our study confirms that the eastern limit of this KMD is Mustang within the Annapurna Conservation Area (ACA), Nepal,” Singh said. The Annapurna Conservation Area (ACA) is located in the western region of Nepal encompassing the five districts, Myagdi, Lamjung, Kaski, Manang, and Mustang, and is the largest protected area in the country. “It suggests that the species of musk deer found between the two extreme limits in the northern Himalayas of India, Pakistan, and west Nepal (west of Mustang) must be KMD, though previously they have been identified as alpine musk deer (M. chrysogaster),” he added. The Kashmir musk deer, the Himalayan musk deer and the alpine musk deer are three of seven similar species found in Asia’s montane forests and alpine scrublands. The other four are Anhui musk deer (M. anhuiensis), forest musk deer (M. berezovskii), black musk deer (M. fuscus) and Siberian musk deer (M. moschiferus). The researchers have called for a review of the geographical distribution of the small and shy deer from the Himalayas and China with a simultaneous review of their IUCN Red List status. “As the species are present across multinational boundaries, there is scope for transboundary conservation,” said Singh. A male Kashmir musk deer with its distinctive fangs. Photo by Paras Bikram Singh. The species are targeted by poachers and are in high demand in illegal trade due to their coveted scent glands for use in perfumes and traditional medicines. Musk deer scent glands are considered more valuable in weight than gold, according to the Wildlife Conservation Society. Active at twilight or at night the musk deer (Moschus spp.) are hard to detect directly. It’s a blink-and-miss situation when they are spotted in their natural habitats: they are generally only seen for a few seconds, or only the sound of them leaping to their escape amid bushes can be heard. The male musk deer’s distinct sabre-like tusks are used during the rutting season to compete with other males. Pinning the musk deer down to their exact taxonomic category has remained controversial and as yet unresolved for four decades because these highly cryptic species are extremely difficult to identify reliably from only their external form and structure (morphology). For instance, the Anhui musk deer, forest musk deer and black musk deer species can easily be confused with each other because of their similar morphology and pelage colour. “Their pelage colour (fur) also changes with seasons, making identification a challenge,” said Singh who took up the challenge in 2010 to navigate the murky world of musk deer classification in the Annapurna Himalayas, where mountains, rivers, and gorges cut off gene flow and lead to genetic differentiation of naturally isolated populations. 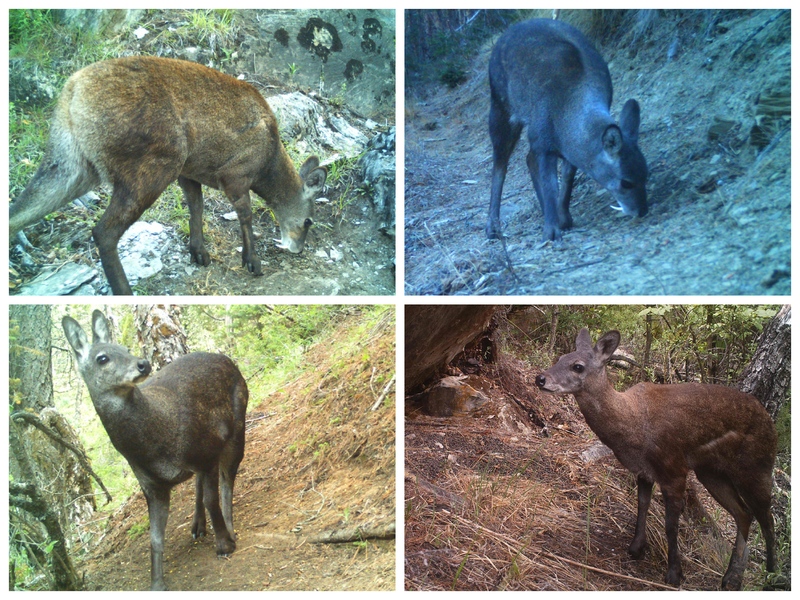 Different pelage colour of Himalayan musk deer captured by camera traps in Manang, Annapurna Conservation Area, Nepal during summer and winter. Clockwise: (a) Male: 6/24/2017; (b) male: 11/23/2016; (c) female: 6/15/2017; and (d) female: 6/30/2016. Photo by Paras Bikram Singh. It was a photograph clicked by Singh in 2010 during a field trip in Mustang that bolstered his interest in untangling the classification dilemma pertaining to the musk deer. “By the look of it, the Mustang deer in the photograph was very unique from the other species said to be distributed in Nepal. Though senior researchers who I had contacted considered it to be the alpine musk deer, I was not convinced in my heart,” remarked Singh. “In 2015-2016 I started my Ph.D. work on the musk deer and installed camera traps in Manang and Mustang (east to west of the Annapurna range). The images indicated likely different species so that spurred us to investigate deeper,” said Singh. The researcher used the musk deer’s latrine habits to their advantage in collecting pellet samples (faeces) for mitochondrial DNA analysis. Musk deer have dedicated sites where they defecate to mark territory. These sites can be used to detect the presence and abundance of musk deer in the field and correlate their habitat preference. “Latrine sites were found in forest habitats where musk deer were photographed,” said Singh. “After we gathered all the preliminary evidence, our team started following the deer and setting up camera traps in the latrine sites and collecting fresh pellets samples,” said Singh. Pellet samples from the Manang, Mustang, and Kaski regions of the ACA were collected during November-December 2016. Photographs of unidentified musk deer from Mustang, Nepal. 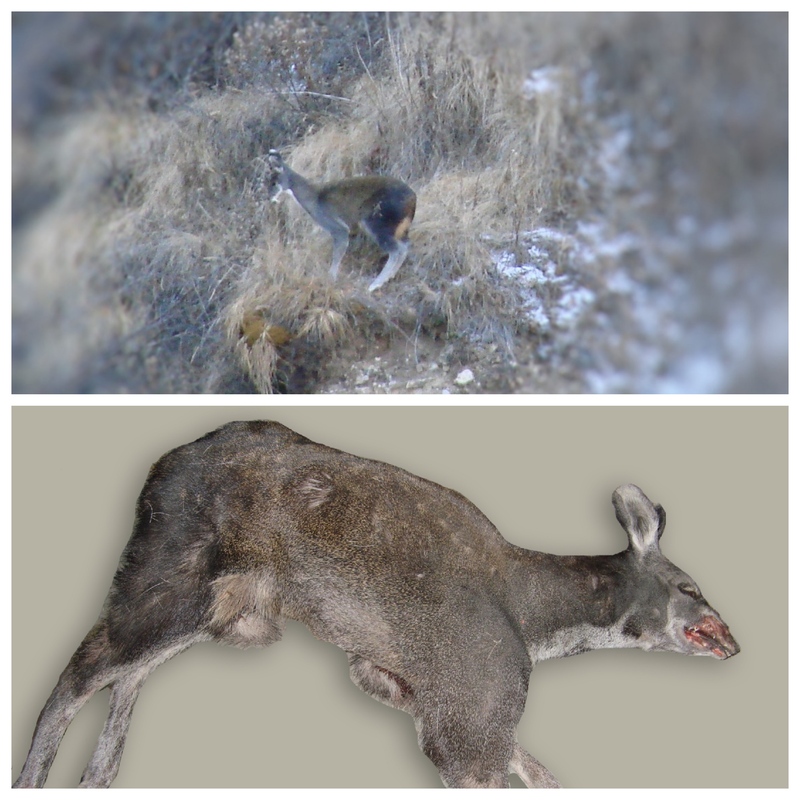 Image of a deer in the wild taken in 2010 (top) and (bottom) image of a carcass seized from Marpha, Mustang, Annapurna Conservation Area. Later, these musk deer were confirmed genetically as Kashmir musk deer. Photo by Paras Bikram Singh. Additionally, deerskin samples (from Manang and Mustang) also came in handy for genetic analysis. These were obtained from dry skins of musk deer that had died from predation and other natural causes and were collected by the ACA staff during forest patrolling from 2009 to 2015. There were some bumps along the road. “Even the U.S.-based National Center for Biotechnology Information did not have the genetic sequence of the KMD. So I contacted WCS’s Stephane Ostrowski, who had led a survey team in Nuristan, north-east Afghanistan in 2009, and he sent a dry skin sample of KMD from that region,” said Singh. “The entire effort was challenging but we made major progress in terms of taxonomic classification of the musk deer in Nepal Himalayas,” said Singh. So far, alpine musk deer, Himalayan musk deer and black musk deer have been reported from Nepal. However, these records are primarily based on earlier observations from neighbouring Uttarakhand, India and the Tibet Autonomous Region of China from presence-only surveys or from anecdotal information. “But based on our molecular analysis and the geographical location of KMD and HMD, we have concluded that alpine musk deer do not exist in the Himalayas of Nepal or in northwest India and Pakistan,” Singh said. “So what we have in Nepal Himalayas is the Kashmir musk deer and the Himalayan musk deer, not the alpine musk deer,” he said. “It is doubtful that the alpine musk deer inhabit Bhutan. Further molecular study of musk deer from Bhutan is warranted to verify the existence of alpine musk deer. It is now apparent that alpine musk deer is found only in central China and HMD is endemic to the eastern Himalayas and KMD in the western Himalayas (which includes central Nepal),” Singh concluded. Locations of sampling sites in western and central Himalaya showing confirmed locations of the presence of Kashmir musk deer and Himalayan musk deer. The pointed circle shows the location of the Himalayan musk deer genetically confirmed in Tibet (Guo et al., 2018). Map from the study. Singh, P. B., Khatiwada, J. R., Saud, P., & Jiang, Z. (2019). mtDNA analysis confirms the endangered Kashmir musk deer extends its range to Nepal. Scientific reports,9(1),4895.